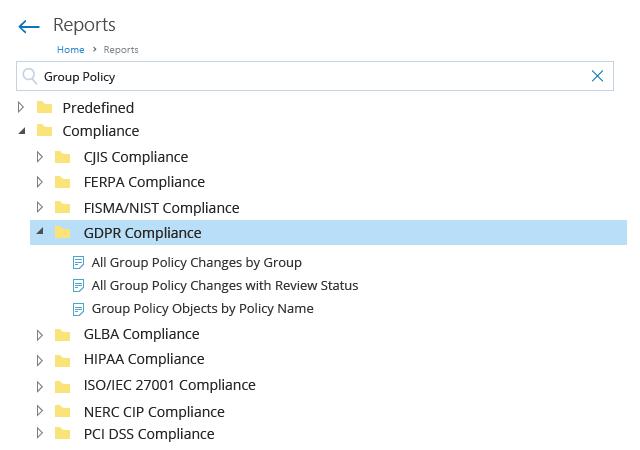 Netwrix Auditor delivers complete visibility into changes made to Group Policy objects, such as security settings and links between GPOs and domain controllers or public key policies, and enables you to compare their current states with your known good baseline, so you can facilitate Group Policy auditing, improve IT security and prove regulatory compliance more easily. Monitors modifications to audit policy configuration and other Group Policy changes, providing the critical who, what, when and where details and before and after values. 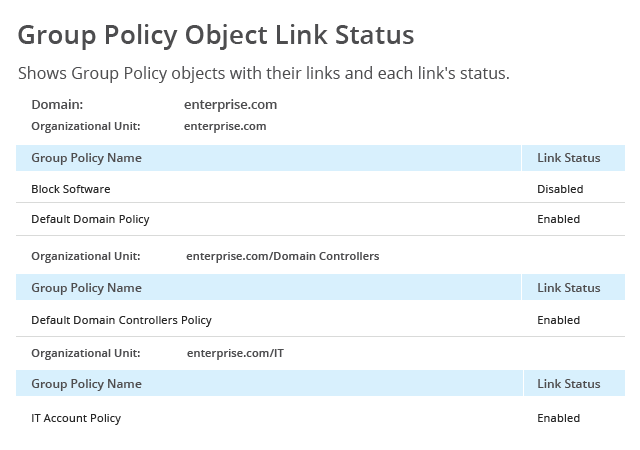 Shows the current state of your Group Policy objects and their settings, so you can easily compare them to a known good baseline. Notifies you about critical changes to Group Policy settings, such changes to interactive logon policy or Windows settings, so you can respond immediately. Enables you to quickly sort through GPO audit data and fine-tune your search criteria until you find the information you need. Save your searches as custom reports that you can run on demand or have delivered to you on schedule. Augments native audit logs by providing comprehensive predefined reports and dashboards with filtering, sorting and exporting capabilities. Email subscriptions automate report generation and delivery. Improves detection of malicious insiders and compromised accounts by aggregating their anomalous activity in Group Policy, Active Directory, Windows Server, Office 365 and other critical systems, both on premises and in the cloud. Slashes time spent preparing for compliance audits with predefined reports mapped to PCI DSS, HIPAA, GDPR, SOX, GLBA, FISMA/NIST, CJIS and other regulatory standards. Keeps all audit trail data in a two-tiered storage that securely retains consolidated audit records for more than 10 years and ensures quick and easy access to the data throughout the whole retention period. Operates without agents, which ensures that data collection does not interfere with system processes or performance. Administrators who rely on native logs only for Group Policy auditing spend hours or even days crawling through endless cryptic logs in an attempt to investigate a single security incident or prepare compliance audit reports. Most Group Policy audit tools can’t help you address these needs. Netwrix Auditor can. With native Microsoft Windows tools, you can’t quickly determine which policies stored in the Group Policy container fail to comply with your internal security controls. Netwrix Auditor’s comprehensive reports deliver actionable audit data so you can, for instance, assess whether your default policies should be re-enabled or linked to the appropriate DCs. 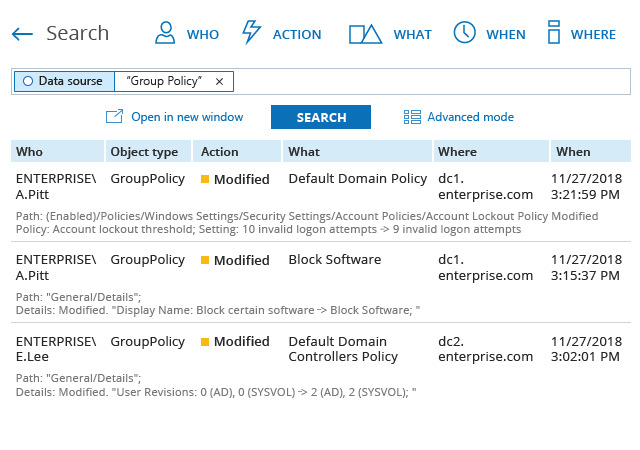 Since GPOs settings control your domains, users, computers and other AD objects, any change made through the Group Policy Management Console could lead to prolonged business service disruptions. Netwrix Auditor notifies you about each modification you deem critical, so you can remediate any improper changes and get your systems back up and running in a timely manner. If you use Event Viewer when trying to get to the bottom of a security incident, you are likely to get bogged down in cryptic event logs for the rest of your day. Moreover, you won’t get the critical before and after value you need to speed the investigation. Use Netwrix Auditor’s Interactive Search to quickly find out who modified your network or audit policies and use your findings to respond and avoid similar issues in the future. Don’t spend days creating custom reports or writing PowerShell scripts when preparing compliance reports for auditors. With out-of-the-box reports mapped to the specific controls of PCI DSS, HIPAA, GDPR and other regulations, you can easily prove that your IT environment meets compliance and security standards. Wyane Transports uses Netwrix Auditor to get alerts on critical changes to GPO settings, slashing the time required to detect and investigate incidents to minutes. With Netwrix Auditor, Sony Pictures Networks India ensures ongoing compliance with SOX and simplifies the audit preparation process significantly. Landmark Structures relies on Netwrix Auditor to ensure that the activity of internal staff and contractors aligns with company policies. IntaPeople enhanced its IT security by quickly detecting anomalous user behavior across Group Policy and critical systems with Netwrix Auditor. "Netwrix Auditor is a fantastic solution that has become a proxy set of eyes and ears, monitoring the network for anomalous Active Directory and Group Policy activity. The volume of information it sorts through would require someone spending 4–8 hours per week. At the rate I pay for MSP support, that equates to a savings of $1,200–$2,400 per month in additional labor cost." Download a free 20-day trial of Netwrix Auditor and deploy it on Microsoft Windows Server. Download our virtual appliance and start using Netwrix Auditor without having to provision any hardware or software. Unlike standalone change and access auditing tools, Netwrix Auditor provides a clear picture of what’s going on across your on-premises and cloud IT environment. It delivers insightful reports with information about who did what, when and where it happened, and the before and after values for each change. You get comprehensive Active Directory logon auditing as well as Group Policy and Active Directory change and configuration auditing in a single solution so you can detect insider threats faster, efficiently investigate security incidents and prove to auditors that security policies are being followed. Having passwords expire is necessary for security, but it is a burden on both users and the IT helpdesk. Automated AD password change notification can help. Netwrix Auditor for Active Directory reminds users to change their passwords several days before the expiration date by automatically sending password expiry notification emails to the account owners and delivering summary reports to system administrators. That way, you can maintain a strong password policy without users getting locked out of their accounts or the helpdesk being overwhelmed with password reset calls. 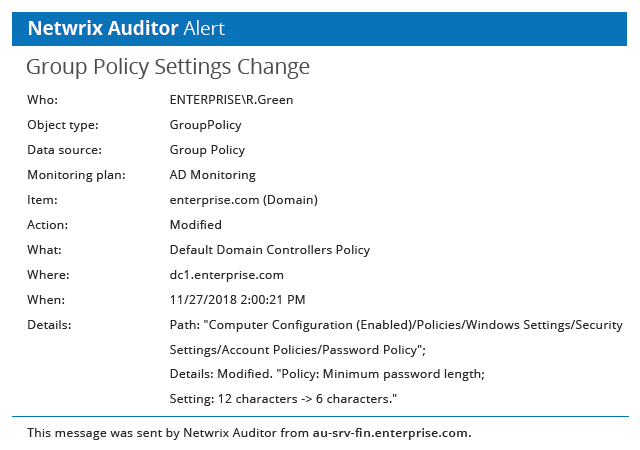 Moreover, Netwrix Auditor for Active Directory notifies you about any changes made to your password policy settings, such as the maximum password age and minimum password length, so you can quickly spot any unauthorized or unwanted modifications and respond before they impact business processes or lead to a breach. Auditing Group Policy and Active Directory using native logs only can be a time-consuming and exhausting process that can easily distract you from your primary duties. Moreover, because of the amount of logs, you will likely miss critical events that could endanger the security of your IT environment. Netwrix Auditor for Active Directory helps mitigate the risk of security breaches and compliance failures by keeping you current on events you consider critical to your organization, such as changes made to user and computer configuration policies, password resets, or DS object modifications. For instance, if a user account was modified, this Active Directory reporting tool from Netwrix will report on exactly which property was changed and how, along with the previous and new values. Every organization is at risk of its inactive Active Directory accounts being compromised. Netwrix Inactive User Tracker provides actionable data about inactive accounts to help you strengthen Active Directory security, eliminate security gaps and streamline user account management. With this insight, you can decide which inactive accounts to disable or delete so they can’t be misused by external hackers or malicious insiders. Managers and compliance auditors often ask IT admins to compile a list of all effective group membership and file or folder share permissions granted to a group or a particular user. With native tools, responding to these requests requires manually pulling together multiple scripts and building reports, which can be both time-consuming and error-prone. But with the effective permissions tool from Netwrix, you can satisfy such requests in minutes, validating the effective permissions and group memberships for a specific user or different groups across Active Directory and file shares.